Kurt Ernst July 13, 2012 Comment Now! 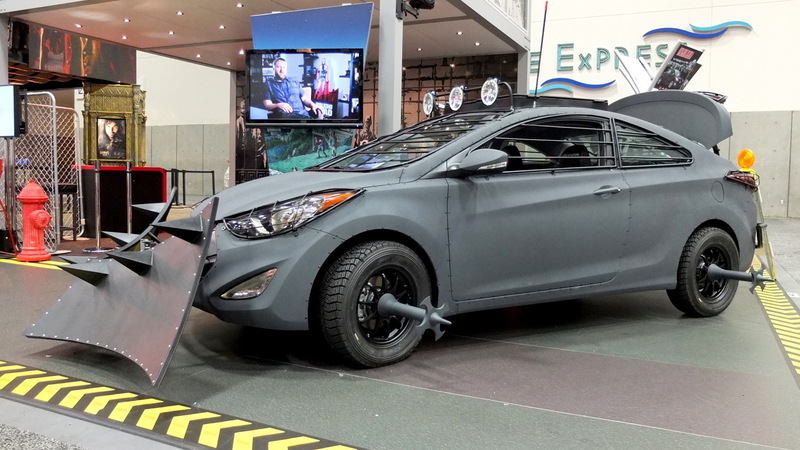 When it comes to choosing a ride for the upcoming zombie apocalypse, we’ll admit that a Hyundai Elantra Coupe isn’t the first option that springs to mind. While it can deliver up to 40 mpg on the highway (an important consideration when there are no more gas stations), its lack of ground clearance excludes it from our own top-ten list. 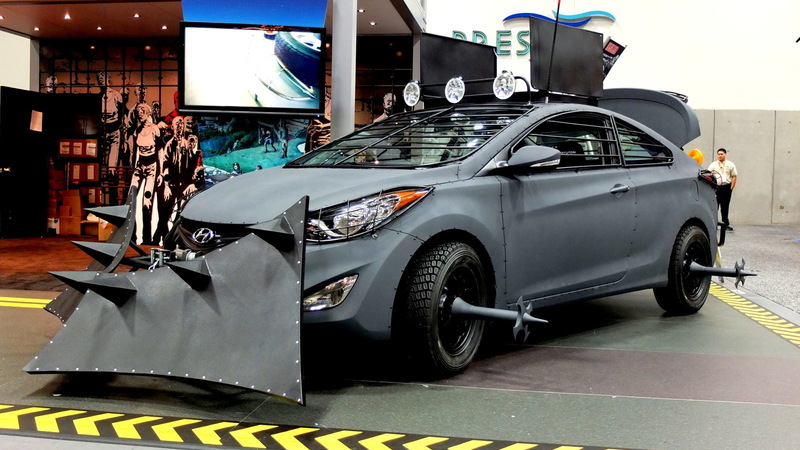 Last month, Hyundai tried to change our mind by serving up renderings of a zombie-proof Elantra Coupe, sketched in honor of the 100th episode of The Walking Dead serial comic. We’ll admit that it certainly looked functional, if hard to translate from paper into sheet metal. 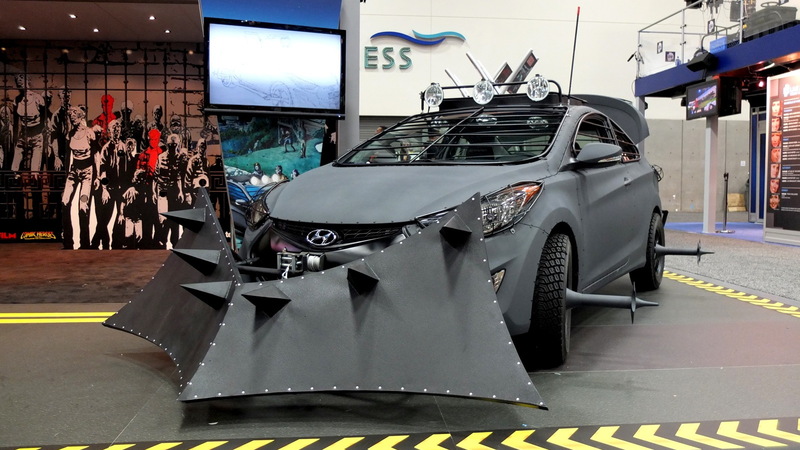 Hyundai and partner Design Craft have proven themselves up to the challenge, completing the Elantra Coupe Zombie Survival Machine (ECZSM) just in time for this year’s Comic-Con in San Diego, California. 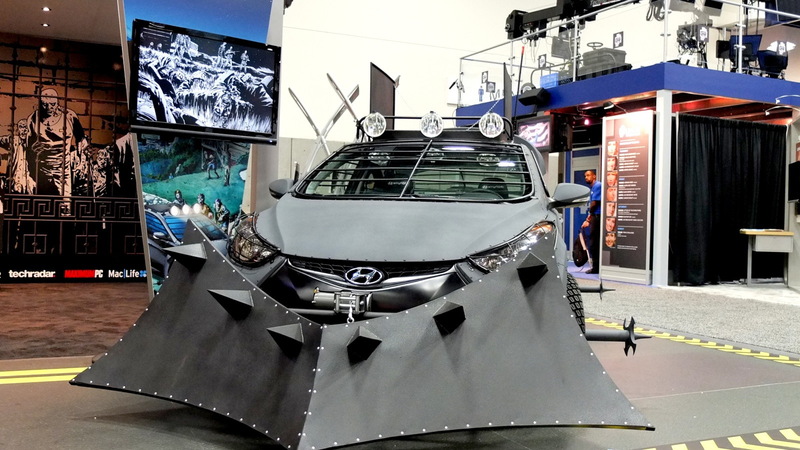 If you’re going to the show, Hyundai encourages you to stop by the Future US booth to see the car up close and personal, and to take as many pictures as you’d like (presumably for inspiration on your own zombie-mobile). The booth even has the ECZSM’s owner’s manual (PDF link) on display, which explains the car’s options, weapons and communications systems. Show visitors can try their luck at zombie target practice, or participate in a zombie costume contest (although we hope the two are separate events). No matter how nicely you ask, though, we don’t think you’ll be allowed to take the ECZSM for a spin. We seriously doubt that Hyundai is considering a production version of the ECZSM, since we’re pretty sure it wouldn’t pass a DMV inspection in any of the 50 United States. 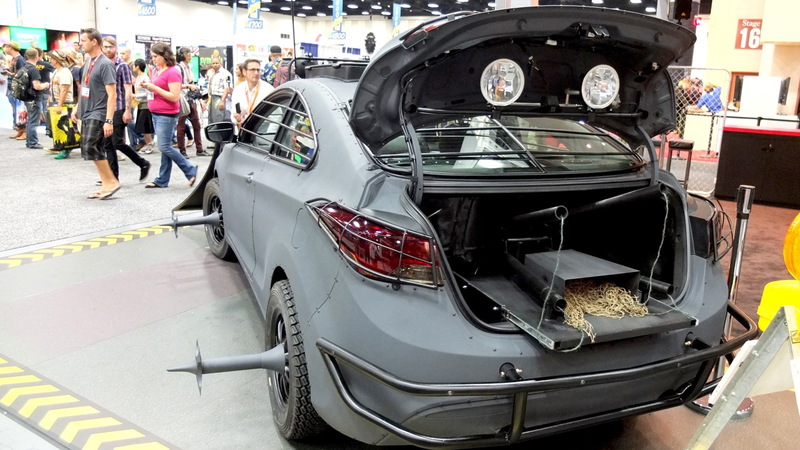 Still, there are some well-thought-out solutions in the car, so if you’re the paranoid type, you’ll want to pay close attention to our photo gallery for ideas.